“Consider the lilies, how they grow: they neither toil nor spin” (Luke 12:27, NRSV). Those flowers sound pretty slothful. 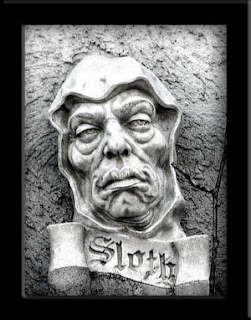 In dealing with sloth, or any of the “deadly sins,” the point is not to squelch, repress, or exorcise the sin, but to understand why it’s there and to recognize its positive function. We all need to chill out, take a break, de-stress sometimes. There’s a lot to like about sloth. We are here to create connection by helping each other to listen to our deepest selves, open to life’s gifts, and serve needs greater than our own. In our deepest self, we know that we, too, like the lillies, shine with a beauty that we do not have to earn, do not work for. It comes not from what we do but from just what we are. “a program for achieving absolute indolence, the secret of a stress-free life....You have the right to be lazy. You can choose not to respond. You can choose not to move." The book tells how to become a sloth in your diet, exercise, work, and even love-life: it warns against true love, for that leads to passion, and passion is the biggest enemy of sloth. There in a flash the problem is exposed: disconnection. Confronted with disease, violence, oppression, injustice how do we not disconnect from life? The spiritual calling is to stay present to life, even the hard parts. We are called to be a student assistant to life. The student assistant is ultimately not in charge, yet here to learn, and to help others. We can disconnect from life and from ourselves by lethargic withdrawal. We can also disconnect from life and from ourselves through frenetic busy-ness. The need, then is to lighten up on our preoccupations with work and worry and achievement, but without sinking into unremitting indolence. The middle way affords space for connecting to our life.